Select the word you want to look up and click Review > Define. Or simply right-click the word and click Define. The dictionary opens to definitions of that word. If no dictionary has been installed, instead of definitions you’ll see a list of dictionaries that you can download. Choose the one you want, and click Download. 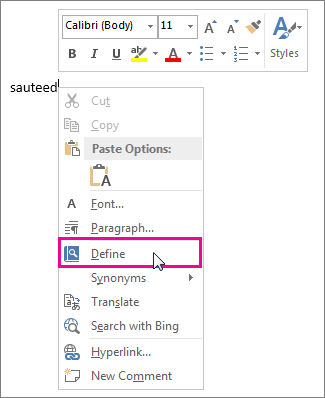 After you install the dictionary, Word will automatically open to that dictionary whenever you click Define. If you want more dictionaries, see Install a dictionary for info. Tip: For a list of synonyms, click Review > Thesaurus. Or, right-click a word and click Synonyms.